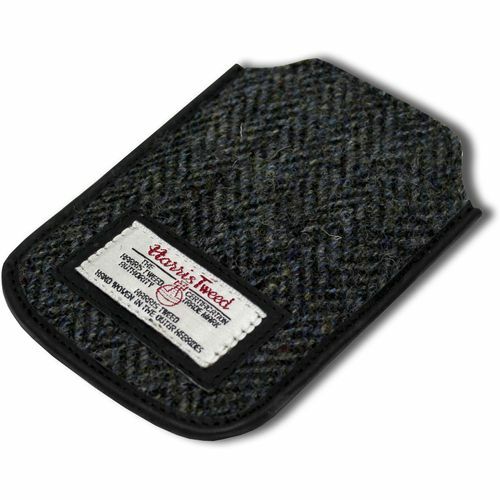 Treat yourself or a friend to a gorgeous iconic handmade Harris Tweed iPhone cover combining perfectly luxury with protection. This has to be the most stylish way to carry your iPhone or any device with the same dimensions. Complete with black soft suede lining, black pu leather piping around three of the four edges, the Harris Tweed genuine label mounted onto a pu leather border sewn onto front/back of case the perfect unisex gift. To open the case at top just push the two sides inwards. The fabric of the case consists of a traditional herringbone design including black, blues and greys and provides a classic British Look.